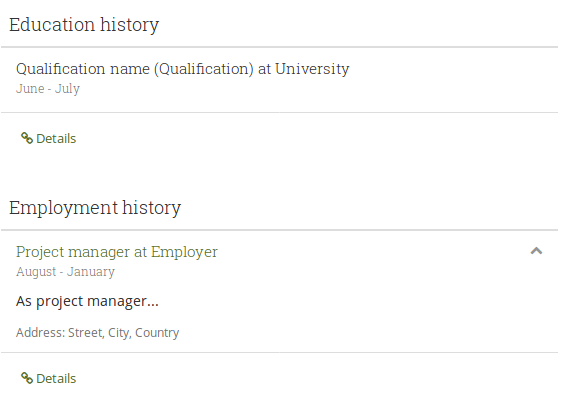 You can provide an institution and employer address under Content -> Resume -> Education history / Employment history. However, that information cannot be displayed anywhere: neither in the Resume in the Content area nor when you display the information in the resume. Why do we collect that information then? If we collect it, we should also display it in the block when looking at the details of such an item. 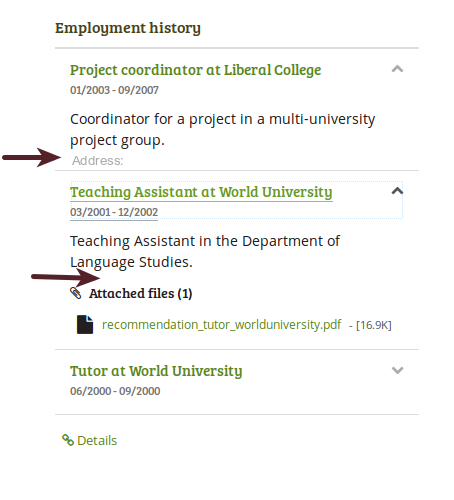 Since it's secondary information, it doesn't need to be displayed prominently and can be displayed when you click the item and it is expanded to show more details about the education / employment item. For a suggestion on where to put it, please see the attached screenshot. When testing the change, I noticed that the address is only shown when you have a description. If you don't, it is not displayed. See the screenshot: The qualification doesn't have a description and no address (there is no chevron to expand the field to see the address), whereas the employment has a description and a chevron to see more, including the address.